Axel Meyer, a professor of evolutionary biology from Germany, was in town for a few days. He likes to fly and I had not seen him for a while so, with Colin’s connivance, we hooked up for a morning of flying to Santa Barbara. Axel was due in SB for a seminar so he and I met at the crack of dawn at the UCLA guest house. A breakfast at Bread and Porridge ate up enough time that Colin could get the boys off to school and head down to the airplane to meet us. 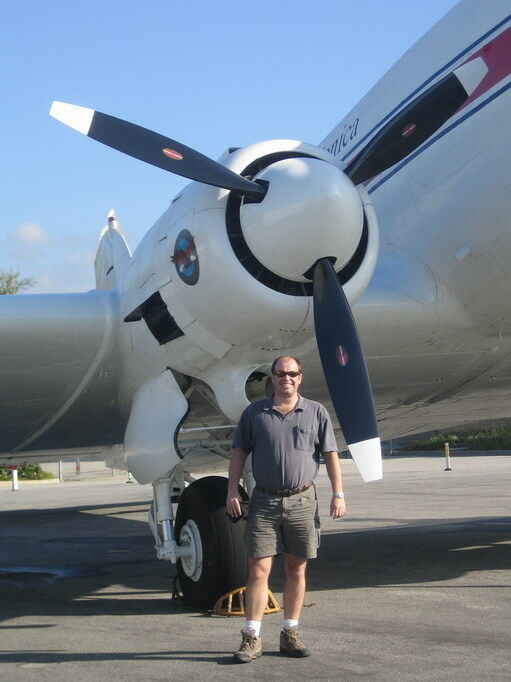 The DC3 is still parked right near Colin’s plane so Axel and I posed under the engine of this great looking airplane. I would love to land this beast, especially at a short strip like Catalina. The autopilot in the DA40 was not working and the second half of this drop off exercise was a trip to Santa Ana to Western Avionics for the repair. I rode in the back seat so that Axel could get a feel for the glass panel and excellent view. We had a blast as Colin hand flew us up the coast past the Point Mugu AFB, over the offshore drilling platforms and into Santa Barbara. The water along the coast really showed evidence of the hard rains we have had. Algae blooms, runoff plumes and torn up kelp beds were consistent features. We landed on the big plane runway and went to Mercury to offload Axel. He rented a car and headed to the University of California at Santa Barbara. Colin and I continued our trip, heading south to SNA. The overhead of takeoff and landing was apparent as the transit time from SMO to SBA was the same as SBA to SNA. A few miles difference makes no time difference on short trips, the time and complexity of the pattern dictate all. 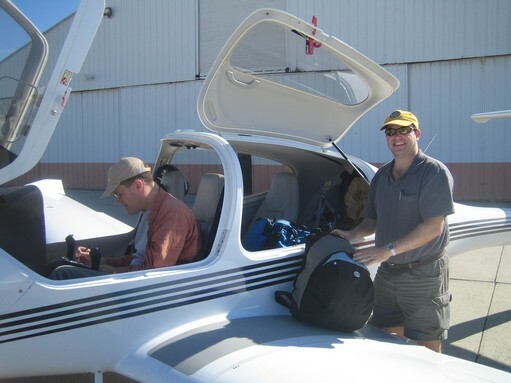 Here is a photo of Colin doing the paperwork after landing at SBA. This entry was posted in Trip and tagged help. Bookmark the permalink.